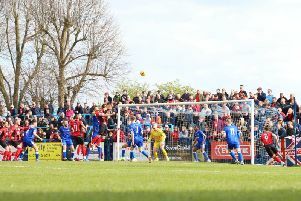 Marcus Law insists the Evo-Stik League South Premier Division Central title race is still in the hands of his Kettering Town players. But the Poppies are beginning to find themselves in a situation where they can’t afford any more major slip-ups after they suffered a 3-2 home defeat to Biggleswade Town at Latimer Park on Tuesday night. Kettering had led through Dan Holman’s first-half header but crumbled after the break as the visitors, despite being reduced to 10 men, wrapped up a deserved success. Law’s team remain four points behind leaders Stourbridge but now have just two games in hand. The top two will collide in the West Midlands a week tomorrow (Saturday) but the Poppies have two games to play before that with Royston Town the visitors to Latimer Park this weekend and another home clash against Coalville Town next Tuesday night. Boss Law was far from impressed with his team’s second-half display in midweek, which came after a late Aaron O’Connor goal had rescued a 2-2 draw at Coalvillelast weekend. And he now knows the Poppies have a “big week” in front them having made life that bid harder for themselves. “We are going to look at this 45 minutes and hope that we don’t get punished for it,” the Kettering manager said. “We have just got to win our games. “Everyone will look at it now and see it’s still four points but only two games in hand. “It’s still in our hands and we have still got to play Stourbridge. It’s a big week and we need a big response. “But we have made life very difficult for ourselves with that 45-minute performance. The Poppies, meanwhile, have allowed left-sided player Ben Toseland to join league rivals St Ives Town on an initial 28-day loan deal as he seeks regular match action.